Offering the Best of the Best in Heavy-Duty Pressure Washing! 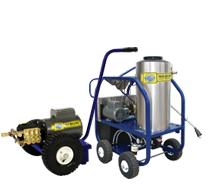 Mercury offers both cold and hot water high pressure washers. Choose from standard or electric cold water high pressure washers, both stationary and portable, fit for a variety of needs. Our hot water models are available in gas-fired, delivering horsepower for tough jobs and all electric for situations where open flames are an issue.